This paper was commissioned by "Earths International Research Society" (E.I.R.S.) 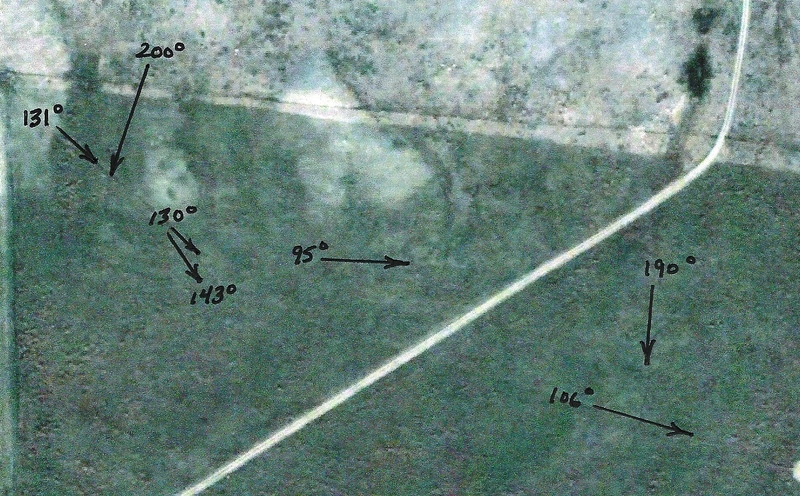 with reference to the Indian Head anomaly located 40 miles East of Medicine Hat, Canada (50 0' 38.20N 110 6 48.32W). 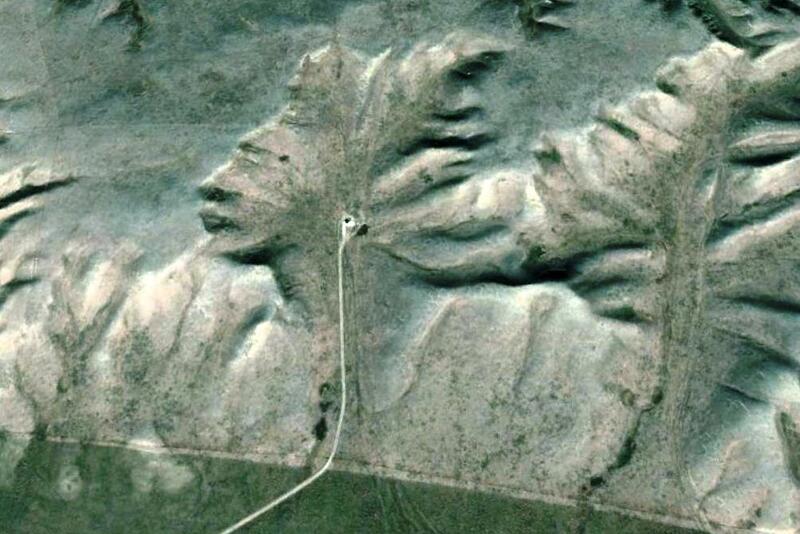 The "Indian Head" geoglyph, that is quite prominent from the air, has been the subject of speculation for many years. During our initial study it was realized that there was more than one caricature located in that vicinity. After further inspection it was learned that the caricatures that existed at the site were related to the Mesoamerican cultures that existed c900BC-c1500AD. 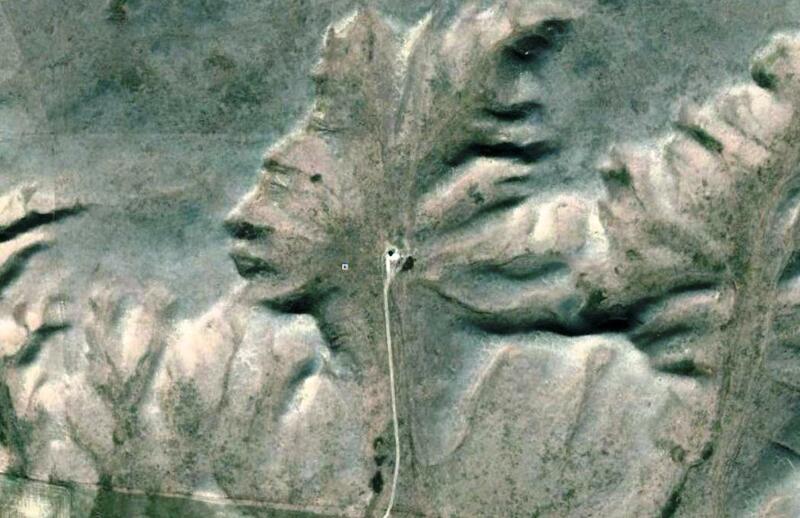 Until now it was inconceivable that such a geoglyph could exist this far north of Mesoamerica. In addition to the caricatures there also existed raised earthen lines throughout the surrounding flat lands. 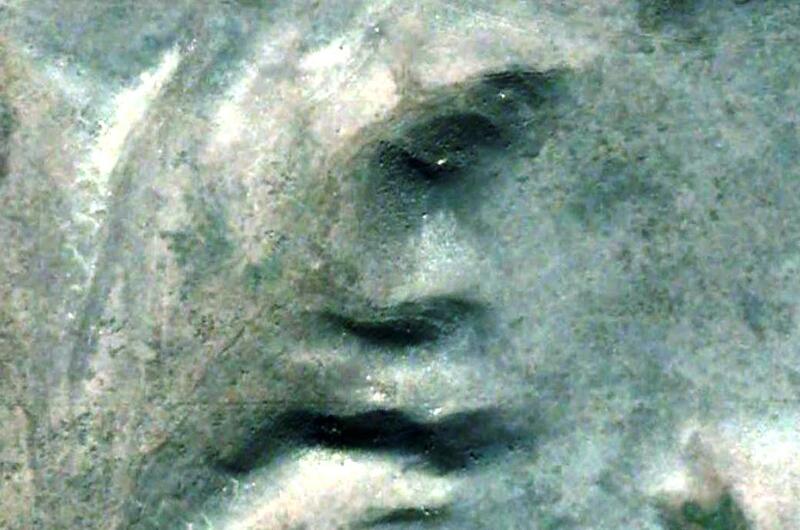 From past experience it was realized that we were not only dealing with facial features but with linier geoglyphs, left there to tell a story. That story comes to life in this presentation. This study involves the use of Geoglyphology. Although Geoglyphology has only recently come to the forefront, it has been used by ancient civilizations for over 12,000 years to outline territories, tell of travels and preserve history for those who are fortunate enough to decode it. The practice of using the geometry of ancient geoglyphs to release the hidden details of their origins is not a new practice and evidence of its use can be found throughout the world. This practice has been handed down through secret societies since long before the building of the Egyptian pyramids. I call the re-discovery and application of this ancient practice Geoglyphology. This study will terminate with conclusions based on the evidence collected from this site and from expertise gathered from the investigation of similar sites around the world. In the field of Geoglyphology, we are plotting lines in a spherical world and then displaying the results on a flat plane. It is difficult to grasp the concept of combining Spherical Geometry with Plane Geometry. That is why modern Geoglyphology could not have been proposed without the advent of software that computes using Spherical Geometry while then displaying the results on a flat plane. This type of precise mapping precludes the initial plotting of these bearings on a flat map. Maps become distorted when converted from a sphere to a flat map. 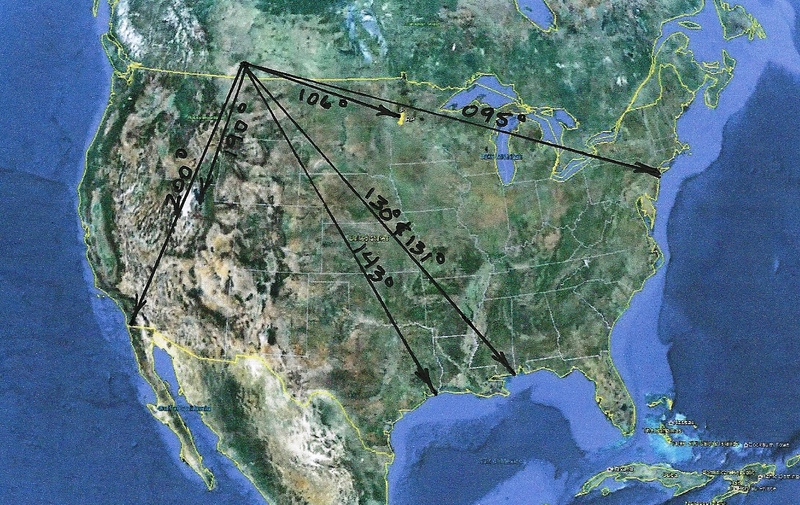 Any lines that are depicted in this article on a flat, non-satellite map were first plotted using the Google software "Google Earth" and then drawn on the flat map after the end points were determined. Even then, the proper curvature is missing. The compelling question is; what knowledge did the ancients possess, in past millennia, which allowed them to accomplish these precise calculations? The accuracy of our sophisticated mathematical software, and satellite imagery, is no more accurate than the calculations done by the ancients. that looks like an earphone is a road leading to an oil well. Image appears to have a ceremonial hood draped over one eye. 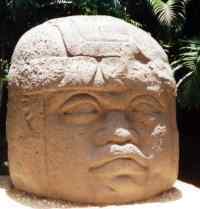 Olmec 1500 B.C. - 450 B.C. Teotihuac 100 B.C. -700 A.D.
Tollee 100 B.C. - 1180 A.D.
Maya 1500 B.C. - 1500 A.D.
Aztec 1325 A.D. - 1519 A.D. 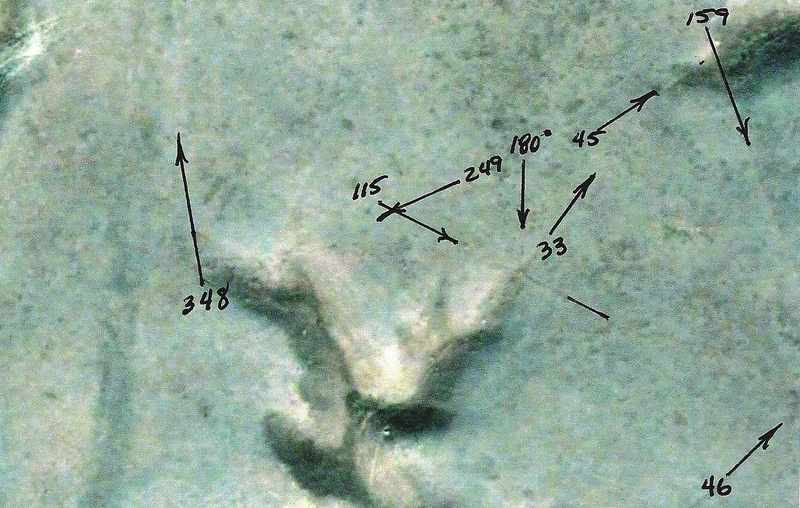 Located 2.17 miles West of the main site on a bearing of 295 degrees. The headgear presented in the preceding Mayan caricature incorporates the snake deity god called Quetzalcoatl. Quetzalcoatl is a Mesoamerican deity whose name comes from the Nahuatl language and has the meaning of "feathered serpent". The worship of a feathered serpent deity is first documented in Teotihuacan in the first century BC and veneration of the figure appears to have spread throughout Mesoamerica by the Late Classic period (600–900 AD). Among the Aztecs, whose beliefs are the best-documented in the historical sources, Quetzalcoatl was related to gods of the wind, of Venus, of the dawn, of merchants and of arts, crafts and knowledge. He was also the patron god of the Aztec priesthood, of learning and knowledge. To the Aztecs, Quetzalcoatl was, as his name indicates, a feathered serpent, a flying reptile (much like a dragon), who was a boundary maker between earth and sky. He was also a creator deity having contributed essentially to the creation of mankind. He also had anthropomorphic forms which allowed him to take the form of the deity that was at hand. Among the Aztecs the name Quetzalcoatl was also a priestly title, as the two most important priests of the Aztec Templo Mayor were called "Quetzalcoatl Tlamacazqui". In the Aztec ritual calendar, different deities were associated with the cycle of year names: Quetzalcoatl was tied to the year Ce Acatl (One Reed), which correlates to the year 1519. Was it a coincidence that Hernan Cortes, a magistrate in Cuba at the time, selected the year 1519 AD to invade Mexico and trick the Aztecs into thinking he was the return of an Aztec God? 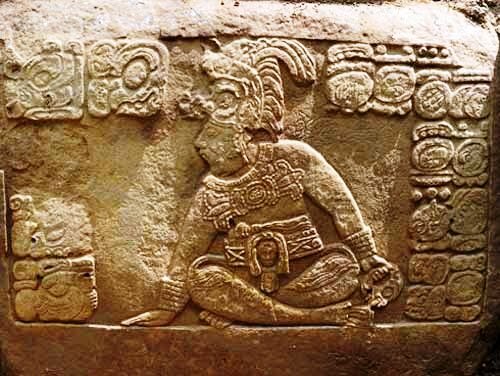 The earliest iconographic depiction of the deity Quetzalcoatl is believed to be found on Stela 19, at the Olmec site of La Venta, depicting a serpent rising up behind a person probably engaged in a shamanic ritual. This depiction is believed to have been made around 900 BC, although probably not exactly a depiction of the same feathered serpent deity worshipped in classic and post-classic periods it shows the continuity of symbolism of feathered snakes in Mesoamerica from the formative period to approximately 1519 AD. On the basis of the iconography of the feathered serpent deity, at sites such as Teotihuacan, Xochicalco, Chichén Itzá, Tula and Tenochtitlan, combined with certain ethnohistorical sources, historian David Carrasco has argued that the preeminent function of the feathered serpent deity throughout Mesoamerican history was as the patron deity of the Urban center, a god of culture and civilization. This would fit with the findings of this study which finds that the site, under study here, was chosen to commemorate and define the territory of a worldwide scientific and religious philosophy which existed for thousands of years, of which the Mesoamerican culture was a part. This should make the pyramids in Mesoamerica easier to understand. At the time of the invasion of Hernan Cortes, and the Spanish Inquisition, Montezuma was Chief of the Aztec empire. 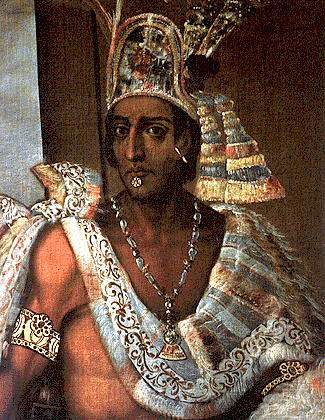 Montezuma was captured and killed shortly after the arrival of his Conquistadores. The ancient knowledge bestowed upon the Aztecs was shared by many ancient cultures which included the Egyptians and Celts. all the geoglyph lines it is suggested that the software named Google Earth be downloaded. Discussion of Glyph Photo 2. When I laid out this geoglyph I immediately knew that that the linier geoglyphs were no older than the early 15th century. 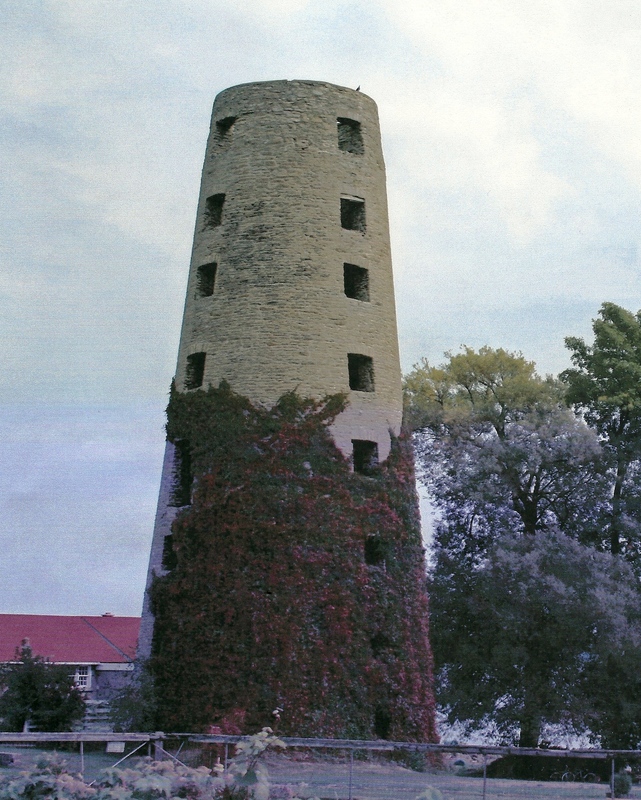 I know this because Faram Tower, identified by the 090 degree radial is dated to the late 14th century. The tower and associated docking facilities were built to monitor traffic on the Saint Lawrence Seaway, as living quarters, a lookout tower, and as defense against indians. Noticing that both Hawaii and Cairo, mentioned in two of the geoglyphs, got me to thinking that this was something larger than the traditional geoglyphic territories previously studied. Discussion of Glyph Photo 3. 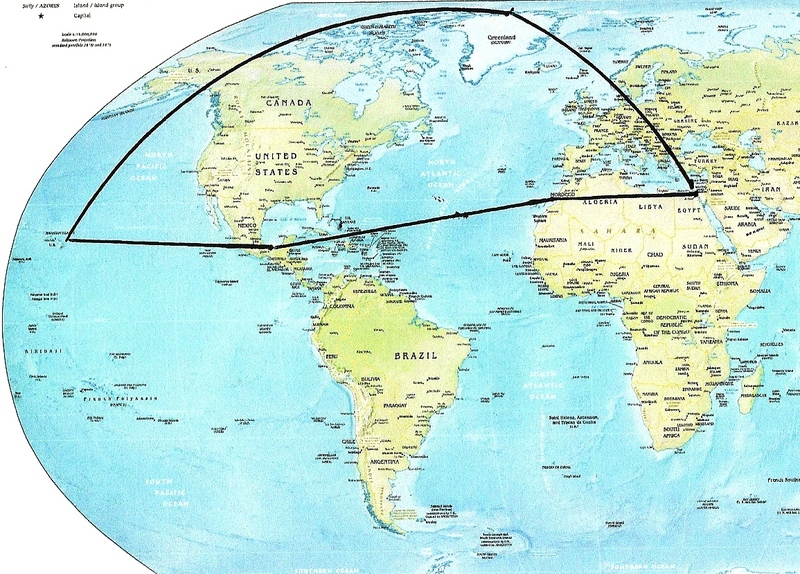 Now we have Cairo, Egypt and Mexico City mentioned. In studies done before this the territorial boundaries outlined a much smaller area, the largest of which might be a continent. I am however beginning to notice a pattern. The endpoints of most of the radials have been used before to outline other, smaller, territories. Discussion of Glyph Photo 4. Things are now beginning to look familiar. All but two of the radial endpoints are familiar and have been used for centuries in Celtic descriptions of their explorations in North America; however, there are two endpoints that I have never seen outside of my own studies. 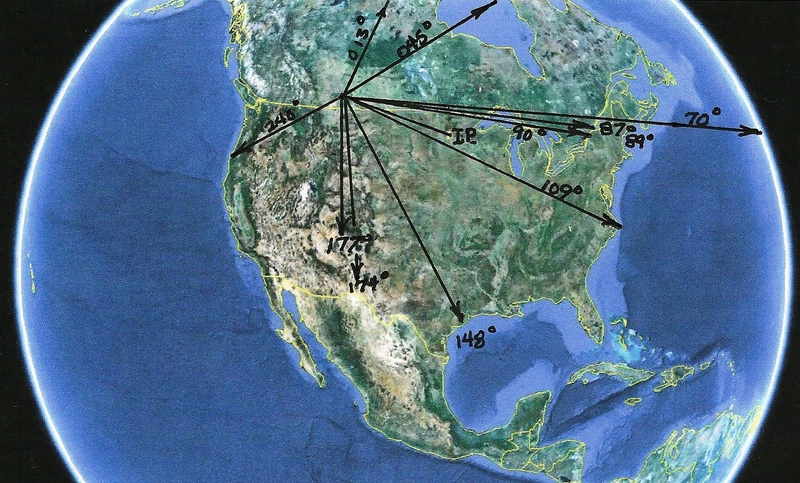 These are the radials which refer to the Anasazi Indian territories in New Mexico and Colorado. Those two endpoints are the Chaco Canyon and the Shiprock locations. I have plotted out the geoglyphs located within the Anasazi area and they share the same protocols as the geoglyphs mentioned in this study. It is now becoming obvious that this site was constructed for something more than the normal territorial survey marker. It is beginning to look like a description of a larger territory encompassing the western cultures which shared the same secret ideological concepts that have been passed from one secret society to another for over 12,000 years. Please keep in mind that secret is not necessarily synonymous with bad. Many societies chose secrecy in self-defense from the negativity of outside sources. Discussion of Glyph Photo 5. Now I am on very familiar ground. 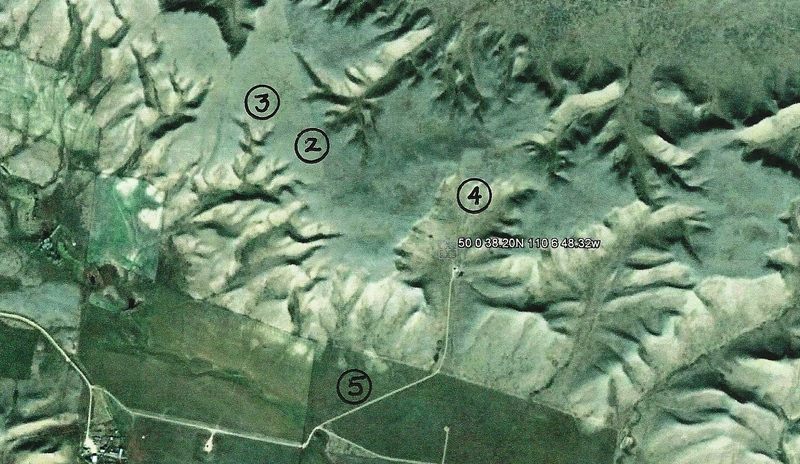 If you will notice, one of the radials in this collection of geoglyphs points to Inspiration Peak. Inspiration Peak is the most important survey marker in marking the ancient boundaries of the North American Territory, which eventually became the USA. As would be expected all the pointers but one, Salt Lake City, clearly mark a point on the US boundary. 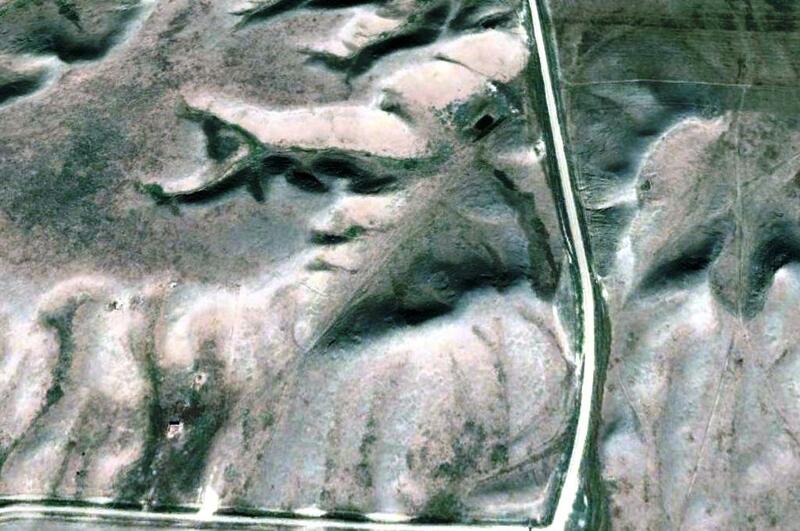 The redundancy of the endpoints, and the location of these geoglyphs, south of the other images, tells me that this group of geoglyphs was, most likely, added at a later time period than the geoglyphs north of here. Another clue that an ancient secret culture was responsible for building the geoglyphs is that had the final boundary between the US and Canada remained as they existed in the ancient description of the North American Territory, these geoglyphs would have remained within the North American Territory. The geoglyph was built by the same group that was colonizing the territory that later became known as the USA. 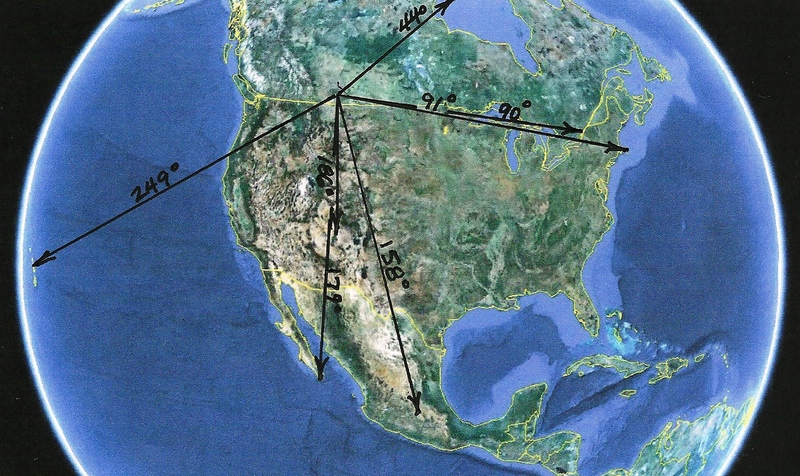 The following photo shows a line, using spherical geometry, running along the northern boundary of the ancient territory identified as the North American Territory. 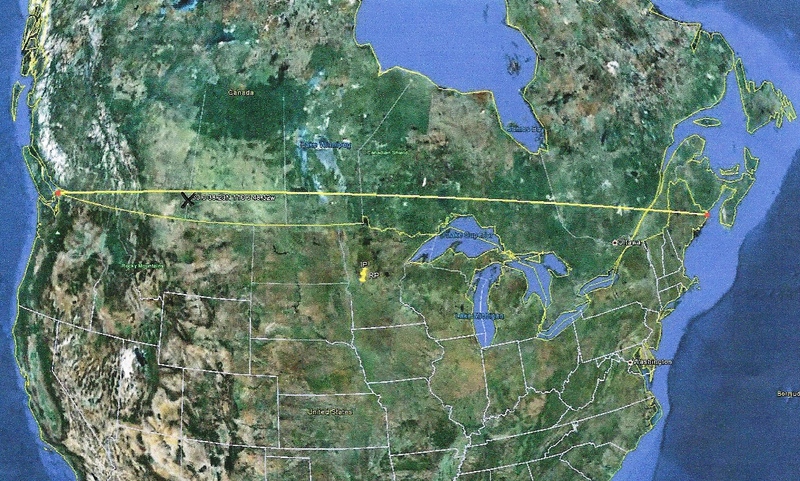 This is the shortest distance between the two end points of the previous North American Territory. Had the northern boundary remained where it was originally conceived it would have placed this geoglyph just inside the North American Territory. The treaty that was negotiated between the USA and the British, after the revolutionary war, moved the boundary to its current position. This placed the geoglyph in Canada rather than in the USA, where it was planned to be. 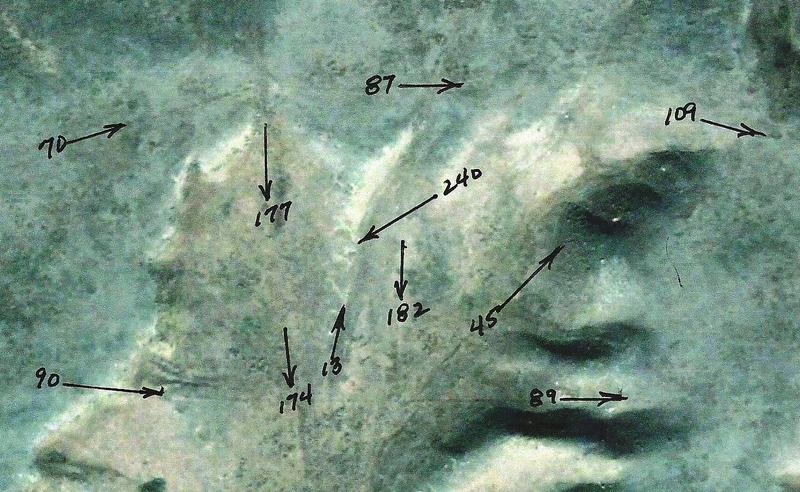 Another test for authenticity was the application of a topographical study. During a cursory investigation it appeared that in order for some features to have been made by the elements, water would have had to run uphill. There are several elements that need to be considered in order to come to a conclusion as to what this geoglyph is about. First there is the definite regional identification of Mesoamerican cultures by the fact that the figures are Olmec, Aztec and Mayan. In addition, the only deity involved here was the feathered serpent which was venerated by all three cultures. 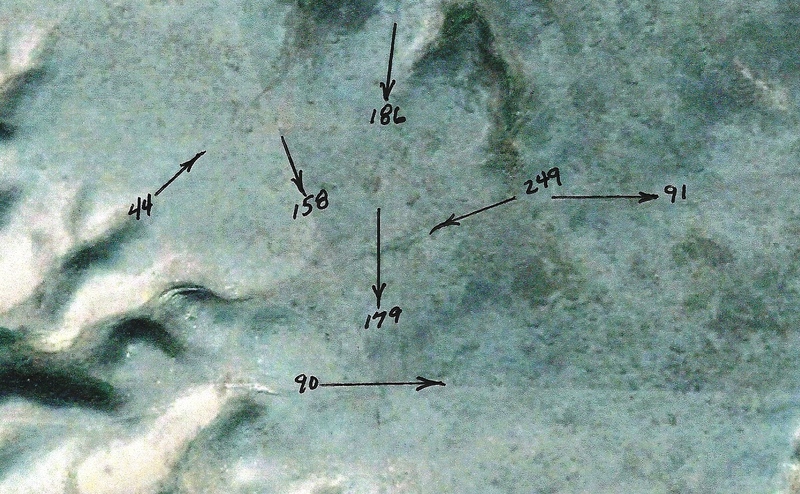 The territory described coincides with many of the same survey markers used by the ancients, discovered in other studies. After plotting out the outer boundaries of the territory, which is described by the linier geoglyphs, a pattern begin to emerge. Virtually all the endpoints described by the linier geoglyphs lie on the boundary of the territories inhabited by cultures who, down through the centuries, have used these same protocols in describing territorial boundaries. In addition, the endpoints have been used over and over in other geoglyphs created by people who possessed these ancient secrets. Secret societies all over the world have used these same protocols for over 10,000 years. These groups, particularly the Portuguese, were interacting and trading in the Americas for millennia, in secret, prior to the voyage of Columbus. 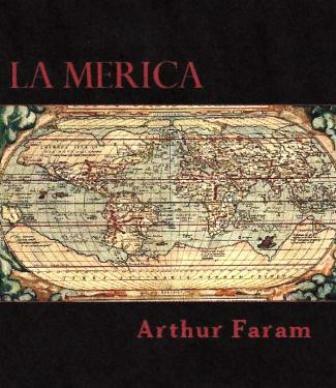 This group, using information handed down through the Egyptians, colonized the entire west coast of South America and Mexico before non-members of the group even knew that the continent existed. Now you know why there are pyramids in Mexico. The thirst for power by Hernan Cortez, the Spanish Inquisition and the Spanish thirst for gold in the Americas destroyed the Mesoamerican cultures that had existed there for over 2000 years. Apparently, the associated secret culture of which I speak were appalled at the atrocities dispensed upon their allies, the Mesoamericans, and decided to construct a memorial to their departed brothers. This conclusion can be arrived at by reviewing the territory outlined by the Medicine Hat geoglyphs. It specifically makes note of two sacred volcanos outside Mexico City and encompasses the precise area containing the countries which were allied with the Mesoamerican cultures. This geoglyph does not stand alone in describing the early colonization of North America. Many more have already been decoded. In this new age of enlightenment it is time to establish the truth about our heritage. This study is but one step, of many, in that direction. FOLLOWUP: Since this article was published this monument has been defaced by the intervention of a bulldozer. The lines are no longer sharp and and the line glyphs are now missing. 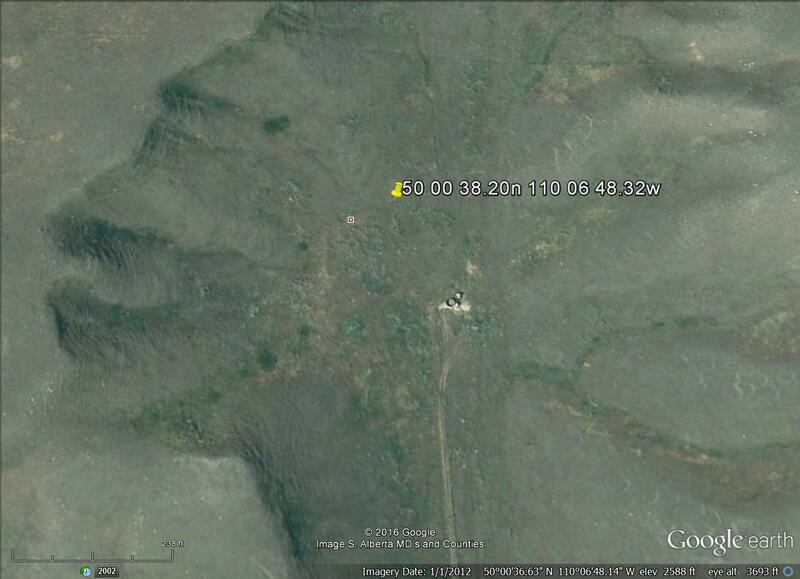 See the satellite images below. Since the defacing, trees have been planted to disquise the tragedy. 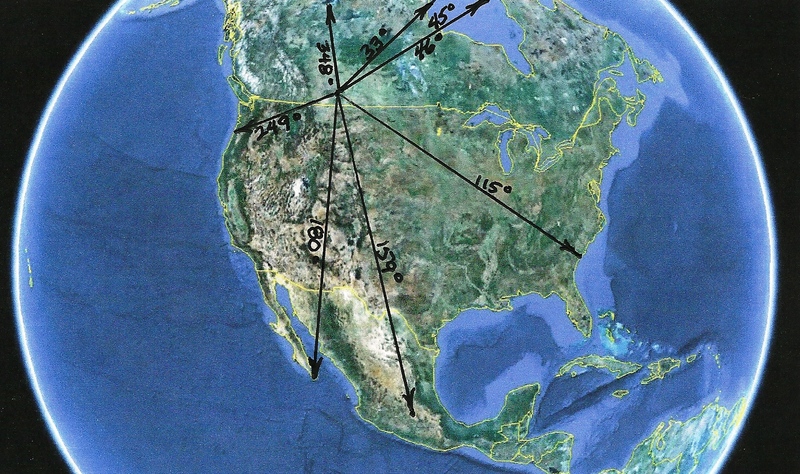 Suggested keywords: geoglyphs, Hernan Cortes, Spanish Inquisition, Montezuma, Olmec, Aztec, Mayan, Quetzalcoatl, sound dues, spherical geometry, Chaco Canyon, Mesoamerica, Mayan Pyramids, Kensington Runestone, Newport Tower, Yonaguni Pyramid, Bosnian geoglyph, Inspiration Peak, Historical Tower Maitland Canada.